I haven’t made a coin quilt since 2008! It’s the pattern that got me truly stuck on quilting. Back then I had 1 baby that slept most of the day…now I have 3 big babies and I want to sleep most the day! Crazy how fast time flies. So pretty! Thanks for sharing…. Congratulations Lori H! You will love it! 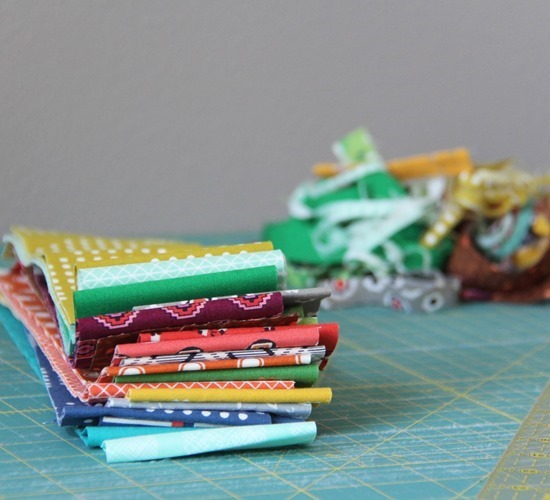 And I LOVE THAT COIN Quilt top!!! "… Oh well …. " I love your attitude. No sense in sweating the small stuff. A quick finish is so satisfying! This is so pretty! The colors are fun. I love randomly placed squares. So you cut all the "coins" and then sewed them together randomly one row at a time? I read the other comments, I LOVE Gwen Marston and I LOVE the rules she made for her class. I'm thinking I might be ready to make a quilt using just those rules. 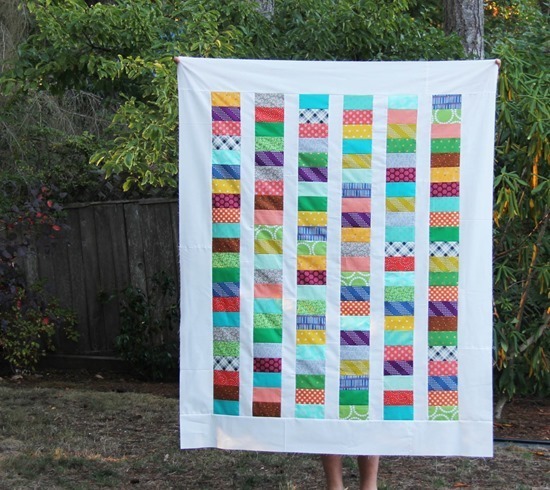 What are the dimensions of the coins in this quilt, please? It's wonderful! I've never made one. I love your piece about wanting to sleep all day. When you get to 66 you will want that kids' energy and not be able to find it!! Thanks for the reminder to make this pattern! Beautiful quilt too! Even when I pay attention to where the colors are I *always* end up with the same one side by side at least once, lol!!!! I think it looks gorgeous and unique! I have three big kids and I want to sleep all day, too. Hahaha! 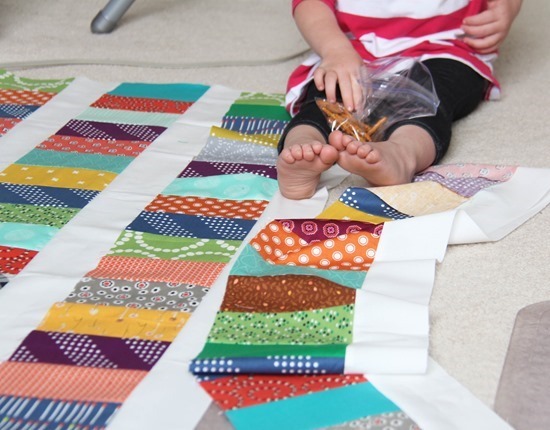 your coin quilt is just lovely! it's fun to revisit an old favorite every once in awhile, isn't it? Love your honesty – kids, they drive us crazy, but we love them anyway! Thanks for sharing and inspiring us with your lovely things! 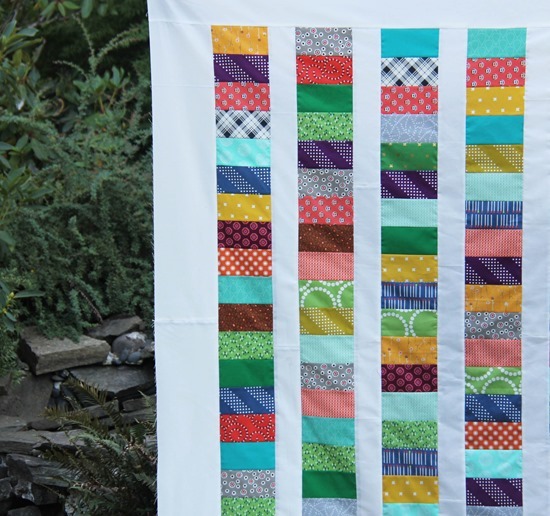 I love how those C+S prints (especially the purple) drew my eyes diagonally down the quilt. Usually coin quilts don't do that for me. Very nice! Such a pretty quilt – lovely colours, proper Autumnal late summer – you've captured it all. I made a huge quilt last year and had to divide up 16-square blocks to put it together and I was amazed how many time I repeated bits entirely by accident. Some fabrics must just love each other! Well done, you certainly have your hands full. I wasn't quilting when our 3 were babies – now they're big babies (all in their 20's) – happy days! October 9,2014 Im missing your blogs it been a while. Im waiting.I love your quilts and ideas.